Tips For Preparing Effective Scholarship Applications - SchoolFinder.com! All fulltime students in graduate degree programs are eligible for awards and financial assistance. This may include Scholarships, Government or Industry Awards or Research Grants. Speak with your graduate supervisor about what is available through your program and research further awards by using the University of Calgary’s Graduate Awards Database, or by looking at External Awards and consider applying for the Faculty of Graduate Studies’ Graduate Award Competition. When planning your scholarship applications, start as early as you can. Rushing your application, you might miss details that may seem small, but could set your application back. If you follow all the directions outlined in the award criteria, you’re already ahead. Consider very carefully which criteria the judges will assess and what weightings these will be assigned. Keep in mind that many of the people who will be reading and assessing your applications may not have a background in your field. If you use explanations that are clear and concise, and avoid using technical terms, your application will be understood by a broader range of people and will have a bigger impact with the judges. Finally, your application will be discussed for a very short period of time, so make sure you make an impression by highlighting your key achievements and contributions. Include all documents listed in the application criteria. These can include information explaining how your research is relevant for the particular award, special circumstances explaining a lower grade or gaps in studies. Depending on the competition requirements, you might need to include original transcripts, or certified as true copies, of all postsecondary transcripts. Even if no marks are yet assigned, a transcript could still be required for applying. Ensure that your application is error-free: Look for spelling mistakes, formatting issues, typos or other errors that will contribute to a lower ranking. Be aware of simple factual errors or budget errors as these will impact your credibility. Be consistent with your referencing system: Use Chicago, APA (American Psychological Association) or MLA (Modern Language Association), depending on your discipline. As you go through this checklist, get feedback from supervisor(s), mentors, faculty in relevant research areas and peers, especially current award recipients. Scholarship workshops offered through the Faculty of Graduate Studies and the My GradSkills program are a good place to get in-depth advice from faculty and peers. 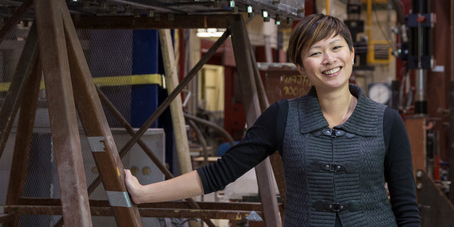 Photo: Donna Chen, PhD in civil engineering, and Killam Laureate. Photo by: Riley Brandt, University of Calgary.